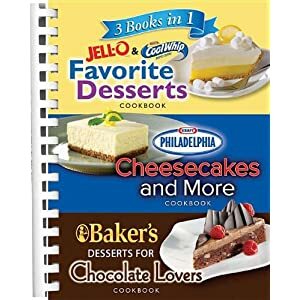 Order This Special 3-in-1 Cookbook: Jell-O, Cool Whip, Philadelphia Cream Cheese, Baker's Chocolate - Get three cookbooks for the price of one. This collection is organized into three sections and offers more than 150 dessert and appetizers recipes that include Jell-O, Cool Whip, Philadelphia Cream Cheese, and Baker's Chocolate products. Combine gelatin and 2 tablespoons mango nectar in a large microwave-safe bowl. Let stand 5 minutes. Microwave at HIGH 20 to 30 seconds or until gelatin dissolves, stirring once. Stir in remaining mango nectar and lime rind; chill 5 minutes. Add mango, stirring gently to separate slices and evenly coat with gelatin. Spoon mango mixture into pie crust. Cover and chill at least 4 hours or until gelatin is set. Top each serving with whipped topping.